Not far from my back door grows a towering cedar tree. In the fall it is covered with small blue berries that attract cedar waxwings to feast. I'm not lucky enough to see them every year, but yesterday I happened to be looking out at just the right moment and there they were, an immense cloud of beautiful birds, all over the tree. They fluttered about eating their fill, making the tree a wild community of activity. And just as suddenly they were gone, moving on to their next banquet somewhere farther south. They do go as far south as Puerto Rico so I am hoping they don't choose that as their journey's end this year. 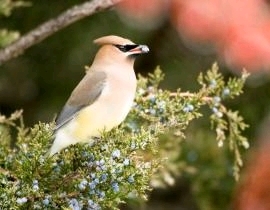 I read this description and could find no better words to describe them, "The Cedar Waxwing is a silky, shiny collection of brown, gray, and lemon-yellow, accented with a subdued crest, rakish black mask, and brilliant-red wax droplets on the wing feathers. In fall these birds gather by the hundreds to eat berries, filling the air with their high, thin, whistles." Not my picture either, but always easy enough to find one on the net. When I'm lucky enough to witness their coming, my spirit soars with them as there is nothing as reassuring, nor as sublime as what Nature, the great creator sends us. Events such as this remind me that though the world of humans may be filled with horrors and sadness, Nature continues in it's eternal ways, giving no thought to any of that. Would that we could truly be more like the "lilies of the field." Tis in the natural world that I find peace and hope, two things missing the world that Man creates.